In Search of Darkness is aiming to be the definitive documentary on 1980s horror films and the crew behind it has just launched the crowdfunding campaign to get it up and running and into the hands of horror fans by July 2019. The documentary is a massive undertaking and contributors from around the world have already donated $22,893 of their initial goal of $32,528. This epic documentary is going to get done, but it still needs a little help to give the most comprehensive look at 1980s horror ever assembled to horror fans. To promote the In Search of Darkness crowdfunding campaign, CreatorVC Studios released another teaser trailer for the project, which is a bunch of clips from some of the best horror films of all time, edited together in a way that any horror enthusiast will enjoy. Clips from Halloween II, The Stuff, C.H.U.D., The Fly, Child's Play, Creepshow, and Evil Dead II are just the tip of the iceberg in the latest teaser for the mammoth project. 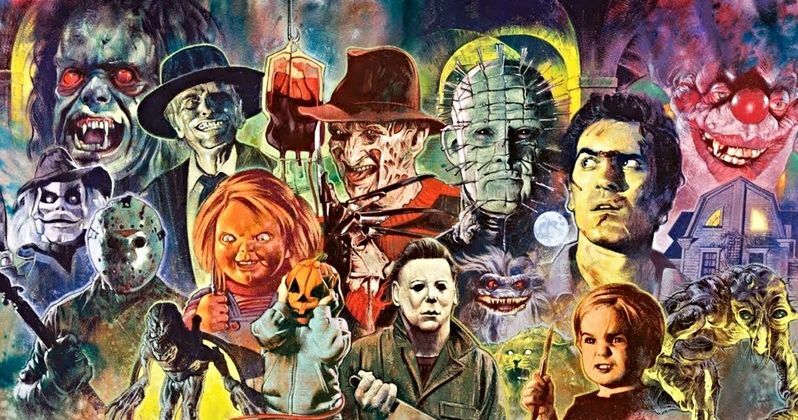 In Search of Darkness will bring together 80s horror icons, modern horror greats, and popular horror influencers to create the most complete retrospective documentary of the genre ever made. The filmmakers behind In Search of Darkness admit that they have seen quite a few horror documentaries over the years, but none of them have centered on the 1980s. In addition to the legendary characters and directors, the filmmakers want to also highlight the artwork, the incredible practical special effects, and the way these stories were a reflection of the era itself. It's going to be a long road to the finish line, but these guys know what they're doing and have more than enough passion to get the job done right. In Search of Darkness will also tackle the huge influence that horror films of the 1980s have had on current horror directors and our culture as a whole. In order to do so, the filmmakers are going to interview current directors and people in the horror community while getting interviews with some of the masters of the genre that brought us here in the first place. In Search of Darkness is not just a love letter to 1980s horror, it's a history lesson. Production on In Search of Darkness is scheduled to begin in January 2019 with post-production beginning in the spring. The filmmakers have set a conservative timeline, which should be easy to complete by next summer. There's already been a ton of work on the project, but it's time for the heavy lifting, which is where the horror community comes in to help. You can head over to the In Search of Darkness Kickstarter to donate whatever you can to help make this epic documentary a reality. Plus, there's some pretty awesome rewards, including posters, t-shirts, downloads, Blu-rays, soundtrack, and much more.